"You don't really know much about Halloween. You thought no further than the strange custom of having your children wear masks and go out begging for candy." Halloween III: Season of the Witch — the red-headed stepchild of the Halloween franchise — came about when producer John Carpenter decided to transform the series into a yearly anthology of films centered around various aspects of Halloween. This installment, released in 1982, attempted to accomplish the task, but ended up meeting with a massive backlash from a fanbase hungry for more Michael following the success of Halloween II. A week before Halloween, Dr. Dan Challis (Tom Atkins) gets called in to treat Harry Grimbridge, a horribly beaten toy salesman with a Halloween mask in a death grip who mumbles ominous warnings in Challis' presence. It gets stranger from there — one of the salesman's assailants breaks in, murders Harry, then sets himself on fire. Challis teams up with the man's daughter, Ellie (Stacey Nelkin), to unravel the mystery; the trail leads them to the town of Santa Mira, which serves as the home of the Silver Shamrock Novelty Company. Ellie's father had recently visited the company to pick up a shipment of their popular Halloween masks — masks like the one Harry had in his hands the night he died. While investigating the town, Dan and Ellie discover that Silver Shamrock's CEO, Conal Cochran (Dan O'Herlihy), has nefarious plans in the works... and that Harry's death served as a warning of things to come this Halloween season. 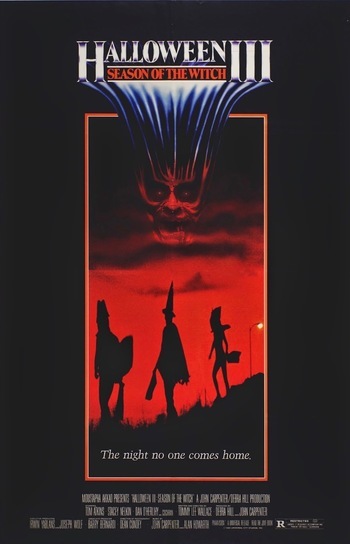 While Halloween III has become something of a cult classic in the years since its release, it performed poorly at the box office, and fans and critics were very harsh on the film for not involving Michael Myers. As a result, John Carpenter walked away from the franchise, which would be given a reboot with Halloween 4: The Return of Michael Myers continuing the story from the original two films. Not to be confused with Season of the Witch. Air-Vent Passageway: How Challis manages to escape his confinement. The Alcoholic: Dr. Challis. Although his drinking never seems to get in the way or slow him down during the movie. More than anything else, it's implied to be a reason his marriage is failing. All Hallows' Eve: Although the entire movie doesn't take place on the holiday, it revolves around it. And Then John Was a Zombie: Dan rescues Ellie, only to find out in the end that she's a robot. Apocalypse How: One of the more horrifying examples: it's one specifically directed at children. Awful Wedded Life: The Challises are not a happily married couple. Bond Villain Stupidity: When Dan gets caught in the factory, Conal lets him live long enough to explain his entire evil plot and then places Dan in a Death Trap. This makes no sense since Dan is of no importance and serves no purpose to Conal. Logically, he should have been killed instantly like every other victim in the movie. Book-Ends: Film opens ends the same way, man with a warning arriving at a gas station (the same gas station, as matter of fact). Brown Note: The last commercial. Celtic Mythology: Conal Cochran really doesn't hate children, but the planets are aligned, and it's time for another mass sacrifice of the innocent on Samhain. Corrupt Corporate Executive: Conal Cochran. The man runs Santa Mira like a police state, invites his top salesman and his family to Santa Mira to kill them, and, oh yes, and his business is a front for murdering America's children. Creator Cameo: Writer/director Tommy Lee Wallace is the voice of the announcer in the Silver Shamrock commercials. Cruel and Unusual Death: Several. Cochran's robots have several very nasty and creative ways of killing their targets, including power drills, crushing their nasal passages to suffocate, and simply ripping people's heads off. Plus what happens to Marge when one of Cochran's magic mask seals misfires in her face. The ultimate has to be Buddy and his family, though, when a test mask executes its Magitek spell and slowly destroys his kid before his eyes...then releases venomous snakes to do the same to him and his wife. Cut Phone Lines: Conal does this to long distance service so nobody can call out of town. Darker and Edgier: Until the Rob Zombie reboot of Halloween, this was the only film in the Halloween series where the stakes were raised which involves the plot to murder of all of the children of the United States because the stars were in alignment, being very Bloodier and Gorier (surpassing its predecessor in violence), and all the deaths fell under a cruel and unusual level of brutality. Death of a Child: Conal Cochran plans to murder children on Halloween night. A kid dies onscreen when Conal activates the curse on the mask. Deceptively Human Robots: Possibly even Ridiculously Human Robots, in the case of Ellie. Cochran's mooks were Magitek clockwork robots and obedient factory workers, but unlike past examples, there wasn't anything the LEAST bit funny about them - they were designed as low-tech Terminators. Doppelgänger: After Dan rescues Ellie, she's revealed to be a duplicate robot. Downer Ending: Challis succeeds in getting the commercial pulled from two channels, but it plays on a third. Thus, Cochran's plan ultimately succeeds, resulting in the probable deaths of millions of children. Worse, he was in the Pacific Time Zone (see Fridge Logic) so the commercial likely already had played in three other time zones while he was still battling Cochran in his factory. Tom Aktins said years later that all the adverts were indeed pulled off the air, so at least the west coast's children survived. Evil, Inc.: Silver Shamrock, of course. Face Death with Dignity: When Challis destroys the Silver Shamrock factory, Cochran simply smiles and claps before being consumed by the explosion. However it's not certain if he's really dead given his supernatural nature. Faux Affably Evil: Conal Cochran's kind nature sours once Dan finds out what's really going on in the factory. Fiery Coverup: Cochran's agent, an android, kills Harry Grimbridge and then strolls into the parking lot, douses himself in gasloline in his car, and explodes. That brings in a lot of police attention beyond the single murder and sets Harry's daughter Ellie and Dr. Challis on the case to follow up on the Silver Shamrock mask harry was clutching when he came into the hospital. For the Evulz: Actually averted by Cochran. He has a very specific reason for his mass human sacrifice. Cochran: Mr. Kupfer was right, you know. I do love a good joke, and this is the best ever, a joke on the children. But there's a better reason! ... It was the start of the year in our old Celtic lands and we'd be waiting...the barriers would be down, you see, between the real and the unreal. And the dead might be looking in, to sit by our fires of turf. Halloween - the festival of Samhain. The last great one was three thousand years ago and the hills ran red with the blood of animals and children. On the other hand, his robots seem to revel in it. Bum on the street talks about burning down the factory in a drunken stupor? The Mecha-Mooks surround him, force him to his knees, and messily rip his head off. Medical examiner - far too late to stop Cochran's plan - discovers that the hospital murderer is a robot? They come and core out her brain with a drill. Go Out with a Smile: Cochran still smiles despite being tricked by the protagonist. Helping Hands: After Challis destroys one of Cochran's automatons, its severed arm attacks him. Hoist by His Own Petard: Cochran gets foiled by his own commercial and Silver Shamrock chips. Horror Doesn't Settle for Simple Tuesday: Horror actually starts before Halloween. Human Sacrifice: Make that sacrifices. Millions of them... almost all children. Indecisive Parody: Mostly serious horror film with occasional moments of silliness. In Name Only: Due to Michael Myers ending up in every movie except this one. Ironically, this movie probably has more to do with the actual holiday of Halloween than the rest. Ironic Nursery Tune: The Silver Shamrock jingle is based on London Bridge. It Wasn't Easy: Cochrane's only explanation of how he got a piece of Stonehenge into his laboratory is "We had a time getting it here. You wouldn't believe how we did it." Jingle: "Happy happy Halloween! Silver Shamrock!" Karma Houdini: Conal Cochran. Challis triggers the block of Stonehenge; Cochran is caught in the middle of the detonation and disappears; the factory burns down around him. His ultimate fate is uncertain, but even if the Stonehenge blast vaporizes him, his plan still goes off and his fate was far kinder than those of his victims. Lampshade Hanging: Conal tells Challis that they had a devil of a time getting the Stonehenge monolith to California — which fails to explain how (though a magician never reveals his secrets, he points out). Also anticipated by the news broadcast about the theft of the monolith. Load-Bearing Boss: When Cochran disappears, the Stonehenge piece magically shorts out, starting a massive fire that burns down the factory. Magitek: Cochran puts tiny pieces of Stonehenge into corporate seals in his masks. When triggered by a flashing picture, they execute an extremely destructive spell, messily decaying the head in the mask and releasing deadly insects and serpents to cause collateral damage. The robots are also a likely example of it. May Contain Evil: The true purpose of the Silver Shamrock masks is to melt their wearers' heads and release tons of venomous creatures to kill everyone in the vicinity as a human sacrifice. MayDecember Romance: Challis is well into his forties, and Ellie is in her early twenties (although she claims to be older than she looks). To be fair, the romance really just happened spontaneously. Challis initially is reluctant to pursue her given the situation, her loss, and the fact he's still married (even if unhappily). Mecha-Mooks: Cochran's henchmen are all eventually revealed to be robots. Mr. Smith: Alias of Ben and Ellie when they arrive to Santa Mira. Mr. Vice Guy: Challis — he's a womanizer and an alcoholic, but he's far from being a bad person and does everything he can to stop the Silver Shamrock plot. Murderous Mask: The lethal masks that Cochran plans to use to murder millions of children. Murder-Suicide: Harry's assassin blows himself up in the parking lot after the kill. He was a Silver Shamrock android. Noodle Incident: How the bad guys got the piece of Stonehenge. Conal Cochran: Ha ha! We had a time getting it here. You wouldn't believe how we did it! Novelization: Contains lots of Purple Prose. Obliviously Evil: Conal Cochran not only doesn't regret that his plan is going to potentially kill millions of children, he considers it to be a fun joke. Oddball in the Series: This is the only movie that isn't involved with Michael Myers to create an anthology series. When that didn't work out, the series went back to Michael's story. Off with His Head! : What happens to Starker and a robotic Ellie herself at the end, via tire iron. Ooh, Me Accent's Slipping: Averted and inverted. Cochran - played by an Irish actor - doesn't have a strong Irish accent for most of the movie, but his pronunciation of Samhain in Irish Gaelic is exactly correct, and while explaining his evil plan his accent not only grows thicker, but less refined to sound more like country folk would. Public Domain Artifact: Conal's Unobtanium comes from chips of Stonehenge. Pumpkin Person: One of the Silver Shamrock masks is a pumpkin. Pursued Protagonist: The film begins with Harry being chased by one of Cochran's minions with a mask in hand. Revealing Cover-Up: Cochran sends an agent to murder the coroner's assistant who's looking into Harry's killer. Ridiculously Human Robot: Cochran's goons, apart from their emotionless attitudes, pass as normal humans relatively easily. Robotic Reveal: When Dan punches one of Cochran's minions in the gut, he manages to pull out wires covered in some slimy substance. And of course, Ellie is revealed to be one too. Halloween is playing on the TV in the bar, and again during the Horror-thon (an odd choice considering Conal's target audience, but whatever). It's announced dramatically as "the immortal classic!" Santa Mira is the name of the town in Invasion of the Body Snatchers (1956). Fitting, no? The Sociopath: Cochran, to the point where he's arguably as horrifying as Michael Myers himself. Kind of. Bits of the original score surface when Challis was tied to the chair and the original Halloween is playing in the background, providing creepy music for the scene. This Is a Drill: Teddy is murdered by being stabbed through the ear with a power drill. Commercial jingle: X more days to Halloween! Title Drop: "Yes kids, you too can win one of the big Halloween 3, that's right, 3 horrific masks.."
Too Dumb to Live: The kid at the end who keeps changing the channel every time the Silver Shamrock commercial gets taken down. He must really want to watch that commercial. We Are Experiencing Technical Difficulties: Subverted — when it happens, it's a good thing for a change. It isn't enough to stop Cochran's evil plan from going off and killing millions, unfortunately. What Happened to the Mouse? : Was Ellie always a robot, or captured and replaced by one in Cochran's factory? If the latter, what happened to the real Ellie — did Cochran kill her, was she killed when the factory burned down, or did she escape? The real robots weren't very talkative, but Ellie early on was quite animated, and was bound to go to the factory. It's probable that Ellie was real until she saw her father's car, and was seen being forced into the factory by other robots shortly thereafter. Notice how Ellie never spoke from the moment that she was "rescued"? The ad hoc robot Ellie was Cochran's last little joke - and assurance that Challis would die no matter what happened in the factory. Ellie was most likely... disposed of. Cochran: A part of our world. Our craft.